Podcasting and smart speakers are “the two most talked-about sectors in audio today.” That’s according to Edison Research and Triton Digital in the “Infinite Dial 2018” report on digital media U.S. consumer behavior. Podcasting may be more than 15 years old, but the researchers found that it continues to grow, including in the car. The topic should find interest at NAB Show, which features a podcasting conference, pavilion and studio. 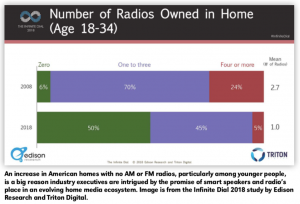 Meanwhile, as smart speakers take off, radio faces a “home hardware challenge.” Twenty-nine percent of respondents do not own an AM/FM radio in the home. Thus radio also is weighing how to maximize those speakers. The promise is captured by a radio trade ad headline: “Alexa, ask Vipology to put my station back in the home!” That company is but one of many hoping artificial intelligence can help radio reestablish its footprint in the domestic media ecosystem. However, the authors also concluded that radio remains “by far” the dominant medium in the car. Separately, Nielsen Audio recently reported that broadcast radio continues to reach significantly more people each week than any other medium in the country at 228.5 million adults 18 and older — that’s more than TV, or apps/web via smartphone, or video on phones, or streaming audio, or satellite radio or podcasts. Revenue growth will be the core goal of many conversations here. Expect leaders to focus on building ad share. Those conversations take place in the context of headlines about heavy debt at iHeartMedia and Cumulus, and the quieter yet significant impact of M&A activity such as Beasley’s acquisition of Greater Media and Entercom’s merger with CBS Radio. Managers are likely to be attentive to takeaways from the Business of Broadcast conference, where topics include how to create more effective ads, digital success stories and the connected car. On that front, broadcast leaders have been working quietly to improve cooperation with automakers, aftermarket suppliers and consultants. Among their goals: making it easier for listeners on Apple Car Play or Android Auto to get back to the native radio tuner. A development that will affect some U.S. operations is the TV spectrum “repack.” Hundreds of FMs will need to power down or turn off to accommodate work on TV antennas by mid-2020. A $50 million provision in the new federal spending plan provides a mechanism to compensate stations. On the FCC front, deregulatory-minded broadcasters have exulted in Ajit Pai’s first 15 months as chairman. The commission eliminated the main studio and newspaper/broadcast cross-ownership rules, killed a requirement that stations retain copies of letters and emails from the public, launched a “Modernization of Media Regulations” initiative and took other licensee-friendly steps. What next? Commissioner Michael O’Rielly would like to do away with AM/ FM per-market ownership sub-caps. “I got a promise from the chairman that we’re going to look at that as part of the quadrennial [review],” he said in a Radio World interview, a process he hopes will start this summer. Another idea gaining attention is an FM Class C4 that could allow hundreds of Class A FMs to increase power. Meanwhile, AM revitalization to date has focused on helping owners obtain and move translators. Tougher AM technical decisions remain undecided, such as changing protected contours to help smaller stations at the expense of longstanding, far-reaching protections of big signals. The FCC also has sought to raise the profile of pirate enforcement, despite former Chairman Tom Wheeler’s cutbacks in field offices. Supporters of stricter enforcement like O’Rielly hope Congress will act on new legislation to put more teeth in FCC statutory enforcement tools. And the FCC is considering sharing the C Band with wireless carriers for broadband. Broadcasters use it for downlinks and worry about interference, especially to unregistered earth stations, of which there apparently are quite a few. Commission officials seem intent on protecting incumbents, so tech leaders emphasize the importance of stations registering now. Technologists too are being challenged to think differently. A skim of the Broadcast Engineering and Information Technology Conference finds less about RF and audio, but much more about cloud tech, big data, blockchain and social networks. Measurement and analytics, too, will only grow in importance. One session title is succinct: “The Mission’s the Same — The Tools Have Changed.” Expect engineers also to debate the possible role of all-digital FM transmission, in light of the presentation by NAB PILOT of new field test results; such tests are seen as an early but important step in understanding all-digital operation. And a trend worth watching is how elimination of the main studio rule might affect studio and transmitter design. Consultant Gary Kline sees opportunity. Randy Gravley, chairman of the NAB Radio Board and president/CEO of Tri State Communications, identified radio’s challenges as increased competition for listeners, keeping and attracting advertisers, the changing auto dashboard, “convoluted” music licensing, sustaining live and local content, the role of digital, and equipping smartphones with radio capability.